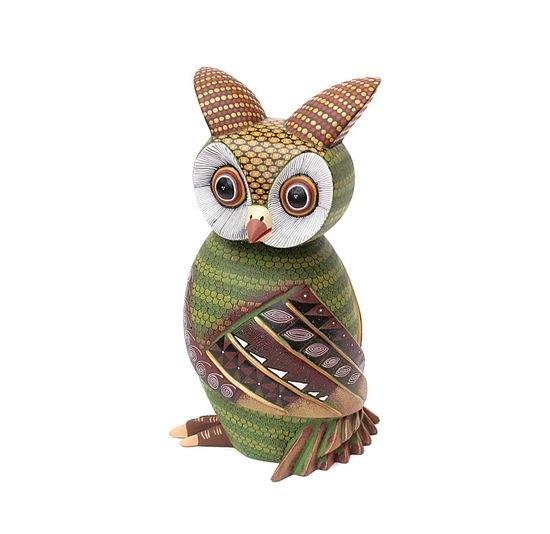 Orlondo the Owl is a genuine, one-of-a-kind, hand-carved, hand-painted oaxacan alebrije created by talented local artist Florencio Fuentes from Oaxaca Mexico -- unique and original. There was a large crowd, and it was growing by the minute. Today was the day that the greatest controversy in all of Oaxaca, Mexico would be resolved. After much debate, arguing, cajoling and bickering it was agreed that the issue would be brought to the wise old owl, Orlondo. He was known far and wide as the “Great Arbitrator,” and today it would take all of his talent and skills to deal with the problem at hand: For today it would be determined which came first, the chicken or the egg! Preparing to go out and face his public, Orlondo checked himself out in the mirror. He looked as regal as he actually was. His deep, black eyes were surrounded by concentric circles of white, rust, tan and were offset by his white-feathered face. The top of his head was a checkerboard of brown and tan, and his body was pea-green with yellow bands. While he was, without a doubt, the most unique example of an owl anywhere in the world, the trait that made him totally above equal was the circle of blue on his lower abdomen. Surrounded by a light-green beaded boundary, Orlondo’s very appearance inspired awe in all those who viewed him. A stately looking gentleman known as “Uncle Rat” stood and made his way to where Orlondo sat. It did not surprise anyone when El Tortuga advanced. The oldest, and wisest, of all the tortoises in and around the city of Oaxaca, Mexico he long had been known for taking up the cause of the underdog. “I will show that it was actually the egg that must have been first,” he said. Orlondo surveyed everyone present, and then made up his mind on how the proceedings would be conducted. With everyone hanging on his every word, he made his proclamation. A nervous titter ran through those gathered as they realized the value of such a plan. Clearing his throat to quiet the crowd, he began his questions. “Why, of course,” Uncle Rat replied almost indignantly. “Hmmmmm. Is Gallo the rooster here?” Orlondo asked. Intrigued, and wondering how he would be entering into this decision, Gallo immediately advanced and stood by Uncle Rat and El Tortuga. Again, the two nodded that they did. A universal “ahhhhhhhh” simultaneously escaped the lips of all those present. Satisfied that he had rendered a sound judgment, Orlondo excused himself and went off to ponder his next great philosophical question: Why, exactly, did the chicken cross the road? Save $25 off your first order, plus get notified when new animals come in from Oaxaca, Mexico. We want you to be completely satisfied with your Alebrije. If you are dissatisfied in any way, you may return your carving within 15 days for a full exchange, refund, or store credit. See our Returns and Exchanges page for details.